Earlier last week, Iranian-backed Houthi authorities arrested 24 Baha’is on charges of espionage and apostasy, which are punishable by death. Amongst those arrested are eight women, a teenage girl, and 15 men that hold leadership positions in the Baha’i community in Yemen. The charges – including accusations of being agents for Israel, the U.S., and the U.K –were formalized during their trial, which took place secretly and without a prior notice on September 15. Followers of the faith claim that they have been subjected to increasing harassment since the Houthis’ rise to power in 2014, and they attribute that to Iran’s influence over the rebel movement. Meanwhile, there has been an increase in reports of harassment and detention of Baha’is in Sana’a, the Houthi-controlled capital of Yemen. This has been accompanied with inflammatory speeches and propaganda in which Houthi leaders and public figures promote waging war against the minority group. A spokesman for the Baha’i community in Yemen accused Iran of crafting and exporting their policy of persecution aimed at “eradicating the intellectual and religious diversity in Yemen”, one which the Houthis have willfully adopted. Earlier this March, Houthi leader Abdel-Malek al-Houthi made a speech in which he denounced the Baha’i faith and accused its followers of collaborating with Western countries and Israel. His speech echoed a 2013 fatwa released by Iran’s Supreme Leader Ayatollah Ali Khamenei in which he called upon Iranians to avoid any and all engagement or interaction with the Baha’is. Al-Houthi’s speech triggered a series of reiterations by news sites, radio stations, and TV programs. A few days later, prominent Houthi writer and strategist Ahmad ‘Ayed Ahmad tweeted that they “will skin every Baha’i to death”. 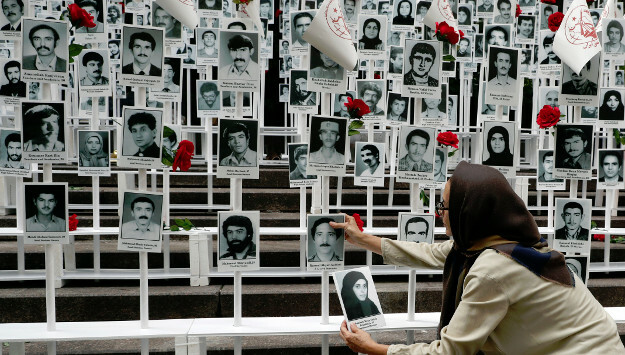 The Baha’i minority group has been systematically persecuted in Iran since the 1979 Islamic Revolution, and has been denied the most basic fundamental rights. Islamic clerics in Iran have long viewed the Baha’i faith as a threat to Islam, branding its followers as heretics. In Yemen, the situation has historically been a peaceful one: Baha’is have lived alongside Yemenis for decades. It wasn’t until the takeover of Houthi militias that harassment, detention, and oppression began in Yemen, where the religious minority constitutes only one percent of the non-Muslim community. The Baha’i are tyrannized because the Iranian government, and lately the Houthis in Yemen, consider them as a threat. They see them as a security threat because Baha’is are accused of conspiring with foreign powers. In January, the criminal court in Sana’a condemned a Baha’I, named Hamed bin Haydara, for his alleged collaboration with the “Zionist enemy,” Israel to destabilize the nation by establishing a Baha’i homeland in Yemen. They are also seen as an existential threat because their religion is not scriptural, and as such, they are labeled as “infidels” and enemies of Islam. The minority group is not acknowledged as a religion but is denigrated as a “satanic movement”. The ruling against Hamid bin Haydara in January marked the first time since 1990 that a judge sentenced someone to execution in a case relating to freedom of belief. Such a marked perversion in the course of Yemen’s judicial evolution is emblematic of the reach of Iran’s political and ideological clout. Amnesty International recently released a press release condemning the more recent trial of the 24 Baha’is, pleading the Houthi authorities to release the detainees and put an end to their constant abuse of the justice system to infringe on the freedom of belief, whether religious or political. However, while the United Nations and other international human rights organizations often condemn and report on systematic persecution of the Baha’is in Iran and Yemen, little has been done to mitigate their suffering or hold to account those responsible for their harassment.